Looking for an Outer Banks vacation home rental that is situated in the center of a family-friendly community and also just a five-minute drive from the beautiful barrier island beaches? Youve found it at The Farmers Sun! New to the Seaside Vacations collection for 2018, this beautifully decorated 3-bedroom vacation rental home is located on the west side of Kill Devil Hills in the popular Bermuda Bay neighborhood. Tucked away from the hustle and bustle of the oceanside communities, Bermuda Bay is best-known for its brightly colored houses that sit along picture-perfect, tree-lined streets in a family-friendly neighborhood that offers a wide array of amenities. Guests who spend their beach vacation at The Farmers Sun will enjoy a gorgeous residence that comes with a wealth of community amenities within Bermuda Bay, including a community swimming pool, gym, clubhouse/recreation room, and a mini waterpark that provides fun for kids of all ages! Just because The Farmers Sun is located on the sound side of this narrow barrier island doesnt mean youll have to make a long journey to get to the seashore for a day of searching for shells and splashing in the surf. 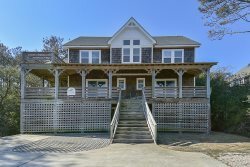 In fact, the wide sandy beaches of Kill Devil Hills are just 1.2 miles away from this fabulous vacation rental home, at the nearby Ocean Bay Lifesaving Station. This popular beach access offers tons of free parking, abath house, restrooms, outdoor showers, an oceanview deck on the dunes, awooden walkway leading to the shoreline, and an in-season lifeguard station, soyou can rest assured your family will be safe during your day of fun in thesun! When you spend your Outer Banks vacation at The Farmers Sun, youll enjoy its convenient location right in the heart of Kill Devil Hills. Dozens of delicious local restaurants are just a quick five-minute drive away from your vacation home, including The Colington Caf, Outer Banks Brewing Station, Kill Devil Grill, Mama Kwans Tiki Bar & Grill, Pigmans Bar-B-Que, Millers Seafood and Steak House, and so many more! You can't vacation on the Outer Banks without paying a visit to one of the many historical attractions the barrier islands have to offer. One of the most famous of these local landmarksthe Wright Brothers National Memorialis just up the road from The Farmers Sun. The main entrance to this site that pays homage to brothers Wilbur and Orville Wright, who made history when they made the worlds first successful powered flight here back in 1903, is only two miles from the Bermuda Bay neighborhood. Located right behind the monument at the Wright Brothers National Memorialand just one mile from The Farmers Sunis a small parking area that provides easy access to a paved pathway that extends for several miles from Kill Devil Hills to Kitty Hawk. Outdoor enthusiasts can go for a jog, bike ride or leisurely stroll along this path to take in stunning views of the Roanoke Soundyou wont find a better spot to watch the sun sink into the water at the end of the day! Nestled in the family-friendly Bermuda Bay community, but also just minutes from some of the best beaches on the entire East Coast, The Farmers Sun is the perfect choice for vacationers who want the peace and quiet that comes with staying in a private neighborhood during their Outer Banks vacation. Enjoy the best of both worlds when you kick back and relax at this Kill Devil Hills vacation rental home this season. What are you waiting for? Book your stay at The Farmers Sun today and let the countdown to a well-deserved week in paradise begin!